The trucking industry will dodge the carbon tax on fuel, with the Federal Government announcing an emissions trading scheme will begin on July 1 next year in a move welcomed by the Australian Trucking Association (ATA). 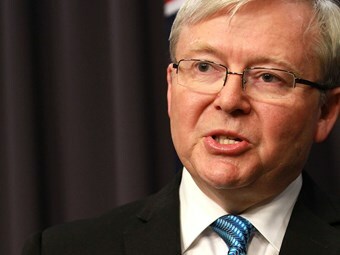 Prime Minister Kevin Rudd unveiled the plan today to introduce emissions trading on July 1 next year and ditch the carbon tax, which would have added an extra 6.85 cents per litre to operators' fuel bills. The scheme will be linked to the European system, which currently charges $6 tonne for carbon. A carbon tax of $25.40 per tonne was originally slated for July 1, 2014. The ATA claims the lower price per tonne of carbon under emissions trading means operators will now pay an extra 1.6 cents per litre extra instead of the 6.85 cents per litre. "The Government’s original plan would have had a devastating effect on many trucking businesses. Its decision to move to a floating carbon price 12 months early would still see an increase in the fuel tax paid by trucking operators, but it would be much more bearable," ATA Chairman David Simon says. "I want to congratulate Prime Minister Rudd and the Government for listening to the concerns raised by the public and business groups about the carbon tax. Simon repeated the ATA’s call for the Federal Government to "exempt the fuel used in trucks and trains from the carbon tax permanently". "As far as transport is concerned, the scheme still targets fuel use in sectors – road and rail freight – where tax increases won’t change behaviour," he says. Simon says trucking companies cannot make the switch to alternative fuels like biodiesel because many truck engine manufacturers recommend against using fuel with more than 5 percent biodiesel in their engines. He says governments should work together to promote the greater use of high productivity vehicles. "A trucking business that switched from using semitrailers to B-triples could reduce its fuel consumption and greenhouse gas emissions by 31 percent," he claims. Rudd says the country's 370 largest polluters will continue to pay for their carbon emissions but the cost to consumers will be reduced. "The Government has decided to terminate the carbon tax to help cost of living pressures for families and to reduce costs for small business," he says. The Government has indicated changes to the fringe benefit tax on cars and a range of spending and job cuts to pay for the loss of $3.8 billion in revenue from scrapping the carbon tax. Many business groups remain unhappy at any carbon price in the absence of a global agreement. given the European price can fluctuate and that move still needs to be legislated for - and the move fails to guarantee "sustainable lower costs". "The Government has recognised the economic dislocation caused by a unilateral carbon price, but this is a short term fix whereas it’s clear the carbon price impost should not have been introduced and should now be eliminated in full," Evans says. However, Australian Industry Group (Ai) CEO Innes Willox is quite supportive, saying it "would save business several billion dollars in cost that, our research shows, they would be very unlikely to recover from their customers". "Further, energy prices would be lowered both for businesses and for households," he says. "This would help stimulate the economy at a time when it is struggling to transition from the slowdown in mining investment."